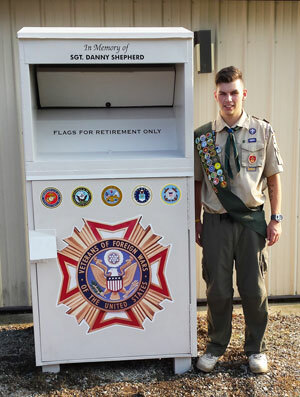 Planet Aid Donates Bin for Eagle Scout Project - Planet Aid, Inc. Planet Aid donated a bin to Logan Keenan, a Life Scout from Troop 176, to help him with his Eagle Scout Service project. The Eagle Scout Project is an opportunity for a boy scout or varsity scout in the Boy Scouts of America to demonstrate leadership as they complete a project for the benefit of their community. Logan chose to refurbish the Planet Aid bin into a receptacle to collect used American flags. He donated the bin to the Veterans of Foreign Wars Post in Columbia Station, Ohio. Congratulation to Logan on completing the project and helping the local community! Looking for a partner for your next service project? Contact your local Planet Aid to see how we can help!